Transformer action depends upon magnetic lines of force (flux). At the instant a transformer primary is energized with AC, a flow of electrons (current) begins. During the instant of switch closing, buildup of current and magnetic field occurs. As current begins the positive portion of the sine wave, lines of magnetic force (flux) develop outward from the coil and continue to expand until the current is at its positive peak. The magnetic field is also at its positive peak. The current sine wave then begins to decrease, crosses zero, and goes negative until it reaches its negative peak. The magnetic flux switches direction and also reaches its peak in the opposite direction. With an AC power circuit, the current changes (alternates) continually 60 times per second, which is standard in the United States. Other countries may use other frequencies. In Europe, 50 cycles per second is common. Strength of a magnetic field depends on the amount of current and number of turns in the winding. When current is reduced, the magnetic field shrinks. When the current is switched off, the magnetic field collapses. When a coil is placed in an AC circuit, as shown in figure 3, current in the primary coil will be accompanied by a constantly rising and collapsing magnetic field. When another coil is placed within the alternating magnetic field of the first coil, the rising and collapsing flux will induce voltage in the second coil. The winding receiving electrical energy from the source is called the primary winding. The winding which receives energy from the primary winding, via the magnetic field, is called the “secondary” winding. Either the high- or low-voltage winding can be the primary or the secondary. With GSUs at Reclamation powerplants, the primary winding is the low voltage side (generator voltage), and the high voltage side is the secondary winding (transmission voltage). Where power is used (i.e., at residences or businesses), the primary winding is the high-voltage side, and the secondary winding is the low-voltage side. The amount of voltage induced in each turn of the secondary winding will be the same as the voltage across each turn of the primary winding. The total amount of voltage induced will be equal to the sum of the voltages induced in each turn. Therefore, if the secondary winding has more turns than the primary, a greater voltage will be induced in the secondary; and the transformer is known as a step-up transformer. If the secondary winding has fewer turns than the primary, a lower voltage will be induced in the secondary; and the transformer is a step-down transformer. Note that the primary is always connected to the source of power, and the secondary is always connected to the load. 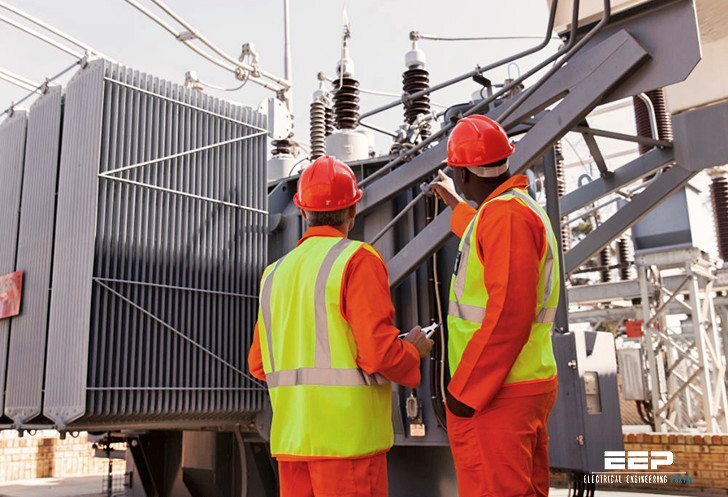 In actual practice, the amount of power available from the secondary will be slightly less than the amount supplied to the primary because of losses in the transformer itself. When an AC generator is connected to the primary coil of a transformer (figure 4), electrons flow through the coil due to the generator voltage. Alternating current varies, and accompanying magnetic flux varies, cutting both transformer coils and inducing voltage in each coil circuit. The voltage induced in the primary circuit opposes the applied voltage and is known as back voltage or back electro-motive-force (back EMF). When the secondary circuit is open, back EMF, along with the primary circuit resistance, acts to limit the primary current. Primary current must be sufficient to maintain enough magnetic field to produce the required back EMF. When the secondary circuit is closed and a load is applied, current appears in the secondary due to induced voltage, resulting from flux created by the primary current. This secondary current sets up a second magnetic field in the transformer in the opposite direction of the primary field. Thus, the two fields oppose each other and result in a combined magnetic field of less strength than the single field produced by the primary with the secondary open. This reduces the back voltage (back EMF) of the primary and causes the primary current to increase. The primary current increases until it reestablishes the total magnetic field at its original strength. In transformers, a balanced condition must always exist between the primary and secondary magnetic fields. Volts times amperes (amps) must also be balanced (be the same) on both primary and secondary. The required primary voltage and current must be supplied to maintain the transformer losses and secondary load. Edvard, I am an engineer in this field. So, I think this is the good book for guid line to share with the people in idea “how to take care our transformer for life expansion”. This will be leading to reduce the gobal warming of this world passing the long life of a transformer. However, the file is not complete in the chapter. If you need to share like I said. please give the book in full version to light our knowledge. Finally, the people die everyday but the transfered knowledge is not die from this world. Thank you. Thanks for the documents, is really interesting and explanatory, so perhaps you could upload the missing pages? You’re welcome Frozzty, glad you find it usefull! This document is as it is, I cannot add anything to it. Sorry! I double checked the link and it works just fine. Maybe you’re having some issues on your side.